S*&t, has it really been two months? I’ve had a “quiet” week at home in NYC, but it’s not like I’m sitting around. Staying close to the crib, but active. This weekend I’m finishing up arrangements for the 92nd Y Jazz in July concert that I’m taking part in on the 21st, in the company of Kurt Elling, Renee Rosnes, Jimmy Greene, Jon Gordon, Kenny Washington, Peter Washington, and 92nd Y jazz artistic director Bill Charlap, my old running buddy with the Phil Woods Quintet. The theme of this concert is the music of Sondheim and Styne, and I’m bringing in some Jules Styne material; an arrangement of “Make Someone Happy” featuring Kurt, “It’s You Or No One” for the band, and a chart on my own “On The Dot” , based on the changes of Styne’s “Just In Time”. These concerts are always a lot of fun with great players and programs well organized and received. I’ve also been in the studio mixing with Dave Darlington as well as in my own home studio , getting “Unsung Heroes” ready to go. I’m a little behind my own self imposed schedule on this first Hollistic MusicWorks release , but I think September should see it out in the world. Wanna hear a little sample (just short of the final mix)? Let me see if I can hook up something and put up a track on the site. I had a great time taking Spheres Of Influence down to the Dominican Republic for three concerts at the beginning of this month, sponsored by the US Embassy there. The band was on fire! – it was inspiring and put me on my “A” game keeping up with those killing young cats (Zaccai Curtis, piano; Luques Curtis, bass; Obed Calvaire, drums, and long time playing brother Pedro Martinez, congas). A highlight was the guest appearance for the Santiago concert of a giant of the perico ripiao (roots or tipico merengue) accordion, Krency Garcia, who’s known by his nom de plume of “El Prodigio”. his prominence in this idiom, Prodigio is also a skilled jazz player who studied saxophone at Berklee. Our cross cultural meeting waswas both stimulating and successful! I hope to learn more about this vital and swinging music and work with Prodigio again. Other concerts were at the July 4th holiday celebration at the US ambassador’s residence and a very hip gig at Santo Domingo’s arty Casa Teatro. We also gave a workshop for the local musicians at the Casa Teatro earlier that day. I hope to be back to the DR soon! Thanks to Rex Moser, the cultural affairs attache at the embassy, who brought us over, Viola Suarez and Nieves Peguero, also from the embassy, and my main man Fernando Rodriguez de Mondesert, who put the bug in the Embassy’s ear to get us over. 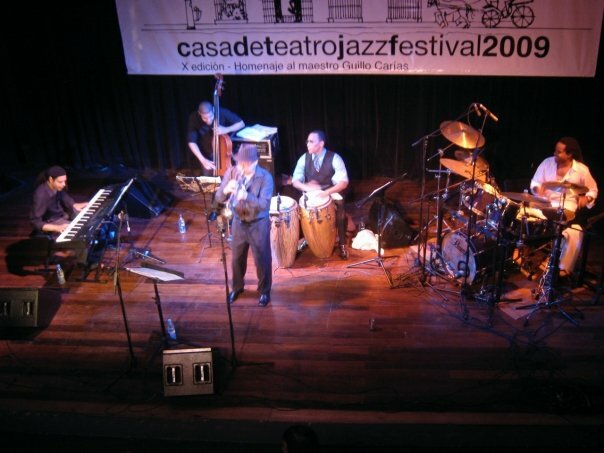 Fernando’s blog “Jazz en Dominicana” is the resource for what’s happening in jazz in the DR.
After the 92nd St Y gig, I’m off the next day for 10 days in Europe with Eddie Palmieri. We hit London, Paris, Stuttgart, Bologna, among other locations. The group is the Afro-Caribbean Jazz ensemble with Yosvany Terry on board for this tour – should be the usual gas! OK, back to those charts….